You’re hovering over the ‘Enter’ button after filling out your email address for a SaaS free trial. “You know they’re probably gonna blast you with emails,” says Mindy Kaling’s Inside Out voice in the back of your mind. For the past two months, I’ve managed to get Mindy out of my head by signing up to 100+ B2B SaaS free plans and trials. But why? I signed up to a total of 100 trials. Those included some for some of the most recognizable tools (think Slack and Mailchimp) along with some up-and-coming SaaS products to study and understand some of the best practices when creating a marketing automation strategy to turn free users into paid customers. This process called upselling, is like inbound marketing on steroids, since technically these prospects are already in your court, using your technology. Their intent is clear and it’s now up to you to prove your product’s value and make sure they get the most out of it. Unlike investing time and energy into attracting new leads, free users are already enjoying your tool and hopefully also sharing it with their teams. Funnily enough though, while upselling freemium to premium plans may seem like fishing in your backyard, marketers from companies big and small are still struggling with how they can best approach this unique group of users to get to them to buy paid plans. 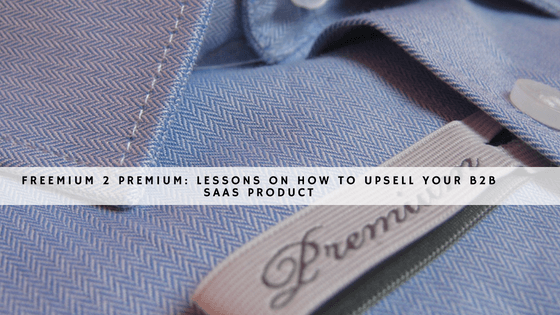 Through my research I found some interesting tactics I wanted to share with you that I hope will help you step up your ‘Freemium 2 Premium’ upselling strategy. Let’s get started. I signed up for the Top 50 and most popular digital marketing tools, and another 50 lesser known tools and tracked their upselling strategy to document the total number of emails sent, verification/welcome email, retention email, and whether or not a sales member reached out via phone. The results are spread out throughout this article to showcase how their strategies differ, but it’s interesting to note that the same upselling tactics were applied among all 100 tools. In fact, in many cases, the lesser known 50 companies are doing more than their more recognizable counterparts to turn freemium users into paying customers. Before we even get into the upselling automation sequences, an important word about picking a freemium plan. 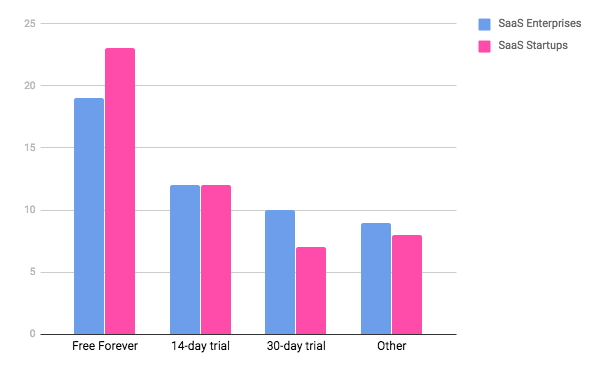 Throughout my research, the most common free plans used by SaaS companies include “Free Forever”, 14-day trials, and 30-day trials. Free Forever proves to be the most popular across the board, which may be due to its ability to allow users to enjoy the product without the feeling they’ll lose their progress on the platform in a matter of weeks. On the company’s end, it’s also great since it allows your team to continuously nurture users into becoming paid members over time. Free forever plans also allow you to advertise and encourage members to scale their plan, as they scale their company. Kind of a win-win for everyone. Trial plans offer a chance for users to get the full effect of your product, which can sometimes be missed with a bare-boned Free Forever plan. As mentioned above though, it can be tricky to have users fall in love with your tool, only to be forced to choose between eradicating their progress or paying up to use it on a monthly or years basis. One last note. Far too often when I was signing up for free plans, websites had flashy CTA buttons like “Start for free” or “Create Free Account”. When I clicked to sign-up, the landing page gave no indication as to what kind of freemium plan I was getting myself into. Was this a Free Forever plan, a trial, a demo? Be sure to be clear with your new users. Bad communication from the get-go is no way to start a new relationship. No matter what kind of freemium plan you’re running, be sure to send a welcome email. This might seem like a no-brainer but you’d be surprised how many SaaS companies just started sending me eBooks or guides on how to use their product. That being said, there are many ways to write a compelling welcome email. Here are a few. Offer a quick demo video - Getting started with a new tool can be daunting especially if you don’t have the time to play around with it. By including a quick demo (1-5 minutes) of your product, you can help your users get up and running in no time. Point out support centers - If you have a community page, a Slack channel, a knowledge base, or an FAQ page, be sure to add those links in this email. Customer success (and the desire to take users to the next paying level) is reliant on customer support. You can also offer one-on-one support using a call scheduling tool like Calendly or Book Like a Boss. Highlight benefits of your product - Everyone enjoys feeling like they made a good decision, so be sure to excite new members about all the ways using your product will change the way they do business. Highlight added benefits over features to show your new users how your product will meet (and maybe even exceed) their needs. Surprisingly, the lesser known 50 companies sent more welcome/verification emails at 88% compared to the 86% coming from the Top 50. On average, the Top 50 companies sent 6.18 total emails, and the lesser known 50 sent 4.32 emails throughout the cycle to try turn me into a premium customer. Out of the 100 companies that I signed up for, only 8 total made the effort to pick up the phone and call me. You don’t need to be good at math to realize that’s only 8%. Phone calls can make all the difference in making a first impression and lasting connection. Call them! Many of the freemium landing pages I filled out asked me for my phone number. 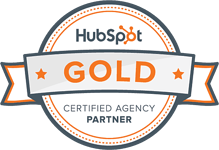 If you can ask for this information and follow through with phone calls by your sales and/or customer success teams -- do it! During my research, I even got a call from Salesforce saying they noticed I filled out that I worked in Tel Aviv, and invited me to go to a meetup of theirs that was scheduled to happen the following week. Offering a personalized experience on the phone is the best way to build a relationship and it’s not cold calling since they willingly gave you their info. Webinars - 15% of my experimentees offered at least one webinar during their nurturing sequence. Some of them were product-centric (e.g. ‘Sell smarter and faster with X CRM’) while others were just helpful know-how (e.g. ‘The power of customer support data to drive executive product decisions’). Whether live or recorded, webinars can be an asset in educating users about your brand, tool, and expertise. Tips & Tricks - Your Freemium 2 Premium campaign is all about showing free users the inside scoop on how best to use your product. Here’s an example from Evernote that I loved. 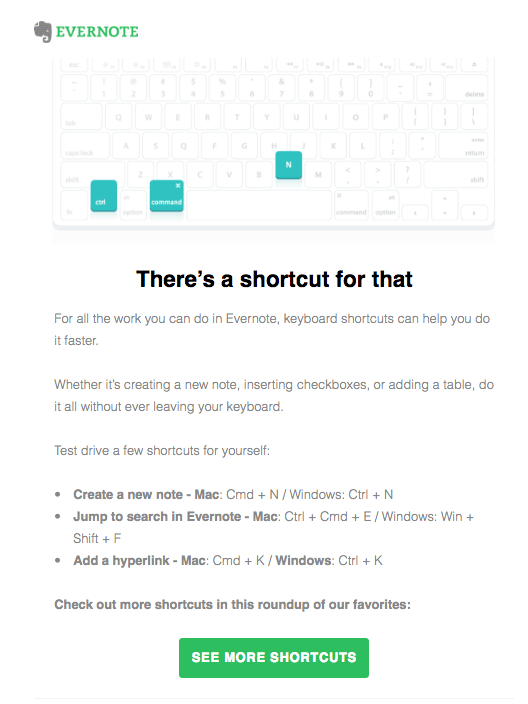 Short and to the point, Evernote shows you some special, lesser-known shortcuts to make sure you’re maximizing your time to get work done. These tidbits can get users reinspired to give your product another shot or take their current experience to the next level. Personalization - When filling out the landing pages to sign up for free membership, I got asked endless questions about myself, my company, and my industry. I complied in hopes I’d see some killer personalization in the email drip; honing in on my details to offer me that tailormade email feeling. For the most part though, I didn’t see any of those personalization tokens other than my name and the occasional company name drop. Lesson to be learned: Be sure to do this right by creating automated workflows based on user information criteria. A little personalization goes a long way in helping you stand out. By being aware and tracking user behavior you can also segment users based on different criteria and prioritize sales calls to users who are more engaged and seem to show a high potential of upgrading. Of the 31 companies in the Top 50 group where a breakup email was relevant (i.e. not a Free Forever plan), only 13 sent emails (42%). Of the 26 companies in the lesser known 50 group where a breakup email was relevant, only 8 sent an email. That’s just 31%. For those of you choosing to go the limited trial route, the breakup email is a crucial way to offer closure and/or a time sensitive call-to-action to get users to buy a plan. To my shock though, check out this graph from my research. 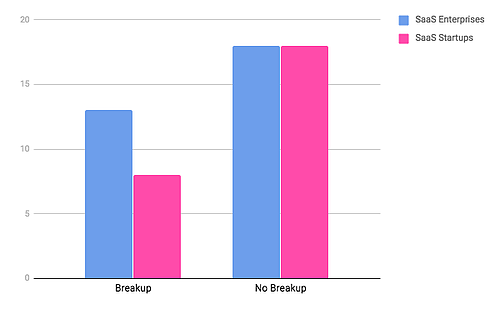 Not including Free Forever plans that wouldn’t need a breakup, the lack of breakup emails to me was staggering. Let’s think of this as a relationship (since relationship building is the center of this nurturing effort). You meet a girl and you decide there might be something here, so you both agree to give it a try. Unfortunately though, this new partner hasn’t been available recently. Does that mean you just let it fade away? Sure, two can play the ghosting game but wouldn’t the common courtesy be to either offer closure, say there’s maybe not a fit here, and part ways as friends or make a royal gesture to get her to commit to trying again? The same goes for trial breakups. If you value your free users, don’t let them slip away without at least a goodbye. With less than 50% of both groupings of companies sending breakup emails, they are missing a large opportunity for key retention strategies. Upgrade in style - There’s obviously the standard “Your Free Trial Has Ended. Upgrade Now to Access Your Data” email subject line. But what if you offered a little something extra? Throw in a discount or coupon for rewarding your users for stepping up their ante. Point out support centers...again - If a user did in fact get invested in your software and now they don’t have a way to access it, good chance they’re feeling stuck. Offer those support lifelines again to ensure they find a solution that best suits their needs. Link that success story - Opening this breakup email, users may be thinking, “is the upgrade really worth it?” By offering case studies that show similar companies (winning chance to work that industry personalization token) who have growth or saved money using your product, you’ll have a good chance at proving your paid plans are valuable in the long run. Offer a trial extension - I’ve seen this done various ways. I’ve seen the breakup email turned into a surprise offering of an additional 14-30 days right off the bat. Other times, there’s an opt-in email that asked users to email them back if they’d like their trial extended. Both are interesting openings to keep users engaged and start up a conversation to better understand their needs. Try A/B testing both and see what works best for your SaaS. Asking for feedback - When it comes to inbound marketing, we usually avoid asking for favors. In general our goal is to offer relevant value constantly, instead of asking for it. One of the few exceptions to this is asking for feedback. Many of my guinea pig Freemium 2 Premium companies asked for users to disclose if they ever used the tool during the trial, why they didn’t think it was for them, and if they had general feedback to help the companies do better in the future. I highly recommend this! If ex-users offer you some insight to help you improve, awesome! If they ignore you, no hard no foul. It was worth a shot. Once again, the lesser known 50 group of companies did a better job at trying to improve their product, with 14% of them asking for feedback. On the other hand, of the Top 50 companies, only 12% asked for feedback. Freemium 2 Premium upselling is a great way to get paid users from a pool of people who are already using your product. When done right, it can be a powerful method to turn free members into brand ambassadors through education and a helpful hand. In addition to getting you paying users of course.